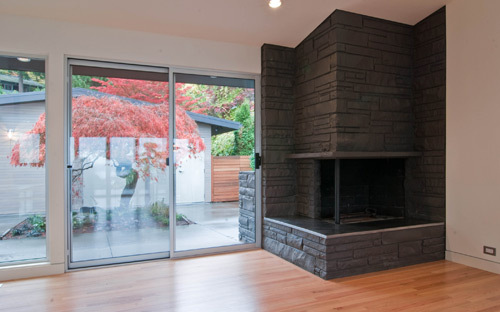 BUILD LLC’s most recently completed project is a mid-century modern home in Seattle’s Innis Arden neighborhood. We covered the exterior of the home in a previous post and today we’ll take an in-depth look at the interior architectural package. Remodeling a home from the 1950’s makes sense for several reasons; the foundation and framing of houses from this era are typically well constructed, the existing framing is usually straight-forward and can be efficiently modified in key areas, and the interior layouts are simple and relatively open. 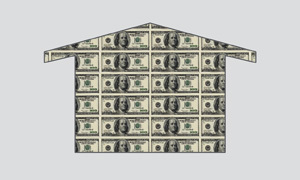 What this means for us architects, is that you can bring a mid-century home up to date cost-effectively. By staying within the existing envelope, construction dollars were focused on a new kitchen, new bathrooms, new cabinets and new surfaces throughout. The construction costs came to $152 per square foot on this project – for a list of everything included in that number, click here. We first looked at a variety of design strategies for the home. The color coded diagram below shows 4 different design concepts for 4 different construction budget levels. This helped the team (owners + BUILD) figure out the critical intersection between construction dollars and scope of work. We think it’s paramount to figure out how much the construction is going to cost before too much time is spent in design. 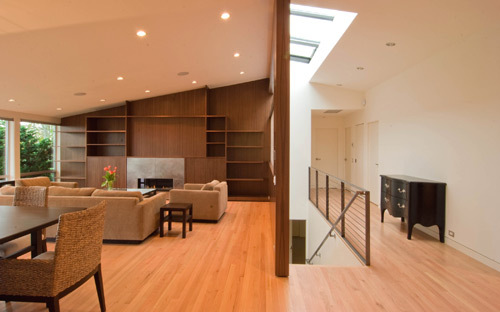 The home owners were instrumental in the design process on this project. Hunting down fixtures, reviewing appliances and sorting through hundreds of granite samples takes commitment and discipline –a huge thanks from team BUILD goes out to the owners for making fantastic choices throughout. The guidance of a good interior designer is also greatly appreciated and we enjoyed working with Jeri Jacobsen of Jacobsen Studios LLC. Demolition on a project like this is more like surgery and carefully taking the house apart has its advantages. Thanks to Seattle’s RE-Store, the owners were able to get tax credit for a number of existing items including the sliding glass doors, lights, pocket doors, appliances and some of the plumbing fixtures. 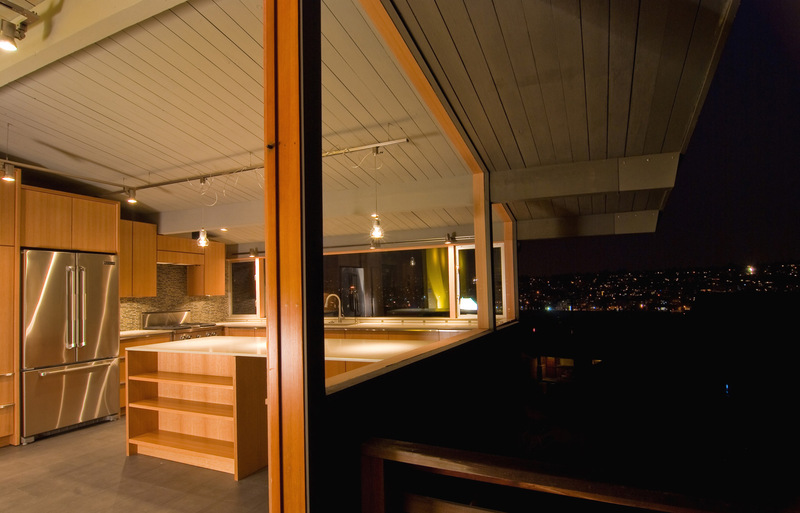 From the get-go, the kitchen was designed as the most important place in the house. It’s where the family spends the majority of their time, and when entertaining, everyone gravitates to the kitchen. In a nutshell, the kitchen is the hub of the house. It was designed with double isles and a twelve foot long island in the center where all of the action happens. 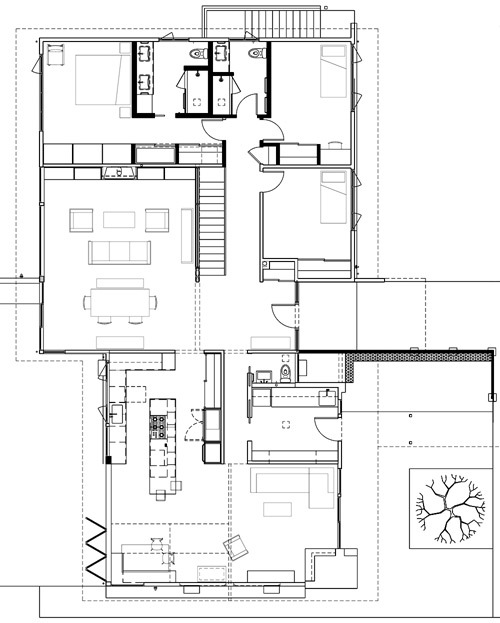 The east wall of the kitchen (on the right) is full height to contain the Sub-Zero refrigerator, Dacor Epicure wall ovens and a full height pantry. Bypass walnut sliders above the appliances allow access to additional storage. 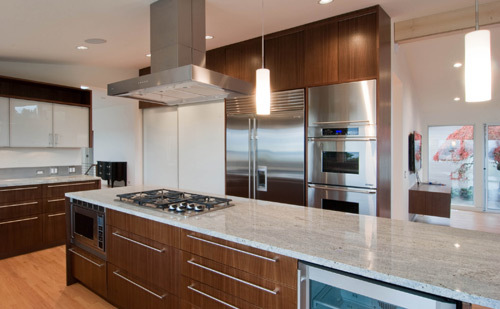 A Dacor 36” cooktop is located at the island and because the hood is one of the main visual points of the room we like to use the Zephyr Roma island hood – it’s sleek, modern and looks great as a centerpiece. Complimenting the hood are the ET2 Rondelle pendant lights which provide good light within an elegant fixture. Inconspicuously tucked below the island are a Dacor Microwave and a GE beverage refrigerator. On the west wall a bank of cabinets houses the Miele dishwasher with integral face to match the cabinet package and the pull-out garbage and recycling drawer. The sink is a custom fabricated stainless steel basin by Metal Masters and the faucet is the Kallista One Pull-Down in polished chrome. The kitchen cabinets are quarter-sawn, book-matched and sequenced walnut veneer with 1/8” edge-banding and a matte conversion varnish built by our very own Special Projects Division cabinet shop. 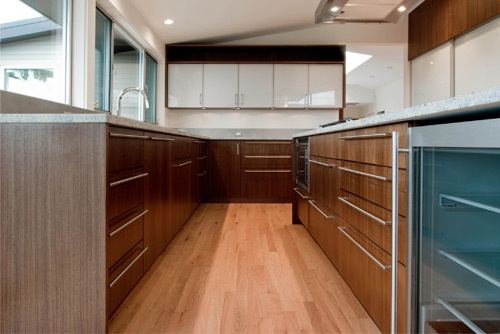 We like walnut because it has a sophisticated look, a fairly regular grain pattern and is readily available. Props go out to Edensaw here in Seattle for supplying some gorgeous walnut. The cabinet boxes are outfitted with the Blumotion soft-close glide system and the Blum Orga-line interior organizers. The Sugatsune 16 series pulls keep to the modern aesthetic by providing function without getting in the way visually. The dark wood tones of the cabinets are balanced out with the opaque glass of the upper cabinet doors and the Raumplus S720 series clear anodized aluminum sliding doors with polar white glass panels that conceal the pantry. 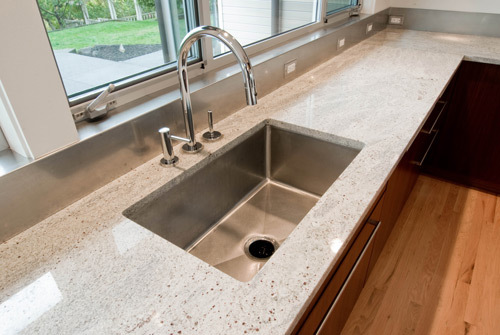 The counter tops at the kitchen are 3cm thick Kashmir White granite slabs with eased edges and they give the kitchen a warm and welcomed texture. Seagull under-mount puck-lights at the cabinet uppers provide a consistent light at the countertop workspace. 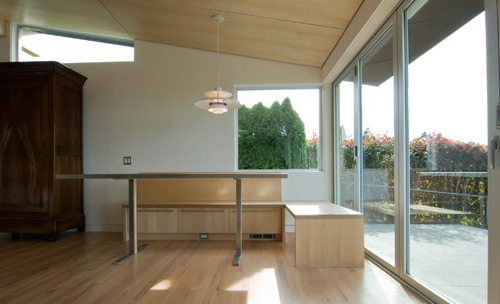 Adjacent to the kitchen is a built-in breakfast nook made from 2 layers of ¾” apple-ply. Against the wall we used cubby drawers for additional storage –on the west side we kept the frame open to integrate with the LaCantina accordion doors which open up to a maximum fifteen foot clear opening. A maple soffit is attached to the ceiling above which defines the breakfast nook, from it hangs the classic Louis Poulsen PH5 pendant light. The stainless steel table was fabricated by BUILD LLC and Metal Masters. The family room incorporates an existing stone fireplace which brings a much needed texture to the room. We painted the stone after a series of explorations on the fireplace and surrounding stone. 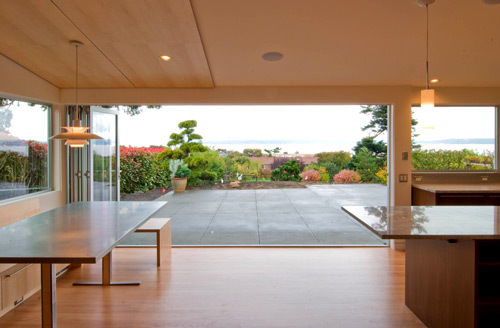 The family room looks onto the private courtyard and frames the Japanese maple beyond. A number of subtle architectural moves occur at the living room. 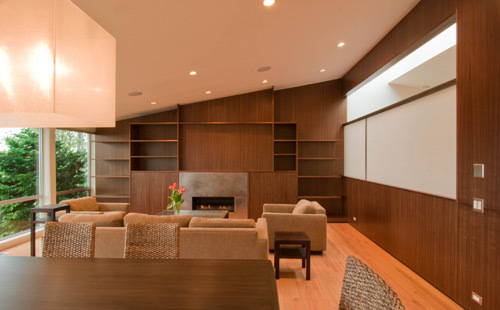 The walnut cabinet package is carried along the north wall and reflected on the east wall wrapping the ridge beam and framing a screen which separates the living room from the stair beyond. The screen is an Oyster Linen texture from Lumicor and it brings a pleasant, light tone to the room. It is ¼” thick and attached with a steel frame. One of the main features of the living room is the Heat-n-Glo Cosmo SLR natural gas fireplace. Its minimal design (note the absence of fake wood logs) offers a clean line of flames to accompany the surrounding modernism. 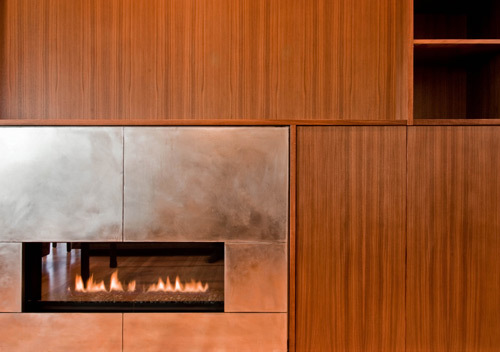 The steel fireplace surround was fabricated by Bart Gibson of BUILD LLC. Bart also took on the work of the stair guardrail and handrail which bring an attenuated formality to the hallway. 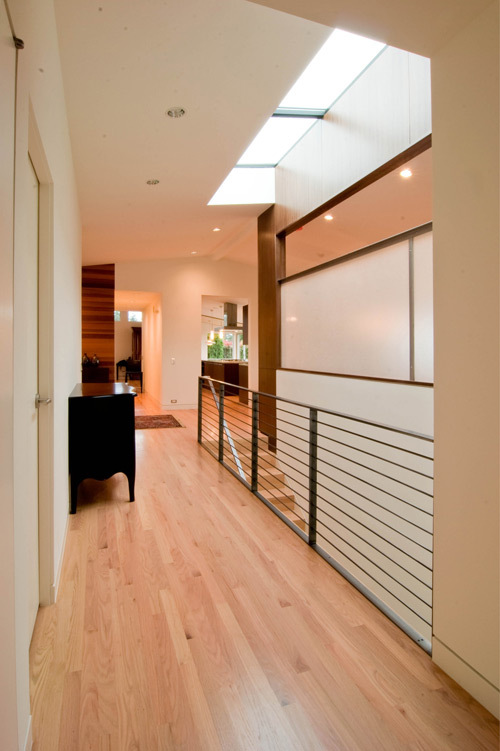 A skylight runs the length of the stairs and includes a remote-controlled operable panel for ventilation. As with most areas of the house, the hallway includes a flush base detail –more about that here. The existing solid oak floors were refinished with 3 coats of Swedish finish and yellow stain by Olde English Hardwoods. A few damaged areas were patched as needed and the floors look brand new. The entry is one of our favorite parts of the house. 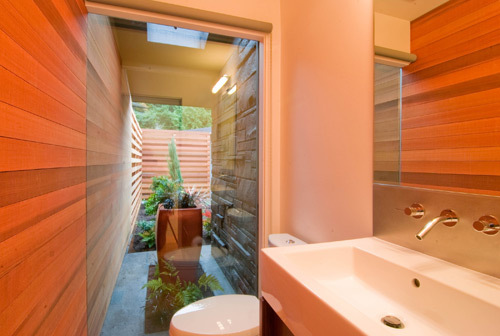 We brought the cedar screen in from the exterior entryway and wrapped it around the south wall into the powder room. 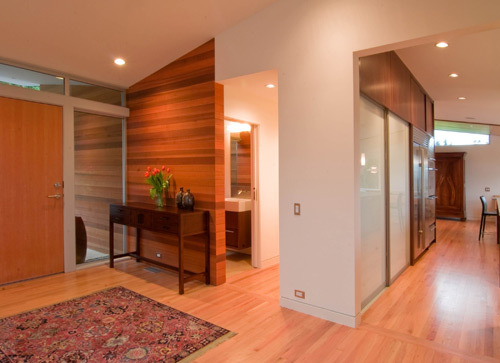 The cedar provides visual continuity as you enter the home and it warms up the entry experience. The fir entry door is outfitted with the Karcher UER29 71 passage lever and deadbolt. The powder room window uses a jamb-less frame at the cedar wall and the cedar boards have been matched on each side lending to the continuity of the composition. A Lacava Auquagrande vanity sits on an SPD walnut box. The wall-mount Kohler Stillness K-T944 faucet, used in conjunction with a non-directional stainless steel backsplash, makes for nice clean lines at the powder room. The toilet is the Toto Aquia dual tank with soft close seat. 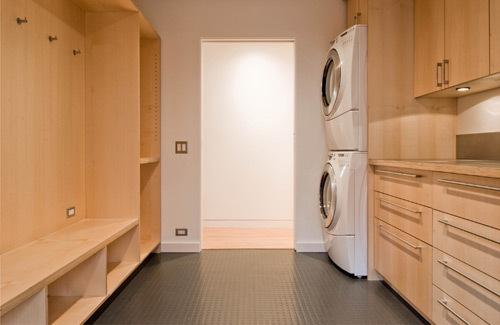 The laundry room/drop sort area is an important part of the house. With two growing boys, it was important to provide space to drop all of the sports equipment and gear before entering the rest of the house. Large cabinet boxes made from apple-ply line the walls of the laundry room and offer plenty of storage cubbies and hooks to drop gear and clean up. An industrial T-106 Iron Rubber floor from Commercial Interiors provides the durability needed in this location. The Hansgrohe Talis prep faucet and Kohler cast iron utility sink are used at this location for their durability. 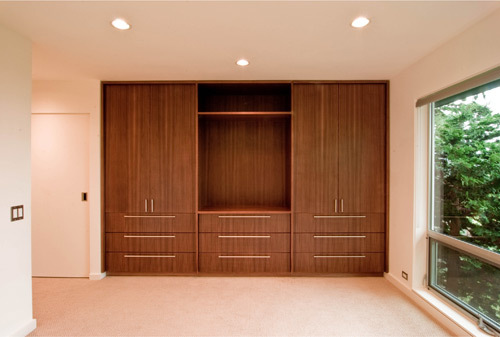 A simple and cost effective palette of materials is used at the bedrooms. The floor is a tight, low profile carpet from Décor Carpet One over an 8lb cushion. We like roller shades with a stainless steel control chain from Atrium Shade because they’re unencumbered and minimal. Thanks to Excel painting, a Sherwin Williams ProMar 400 interior latex flat white paint continues at the walls and ceilings. 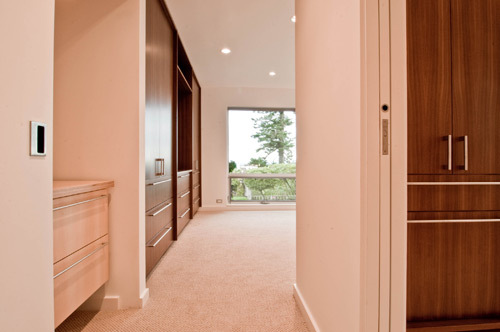 The master suite has a few design features superior to the other bedrooms such as a bank of walnut cabinets as the main feature in the master bedroom. In addition to storage for clothing, the center bank allows for the display of an art piece or sculpture. Apple-ply cabinets are also installed behind the bypass doors. 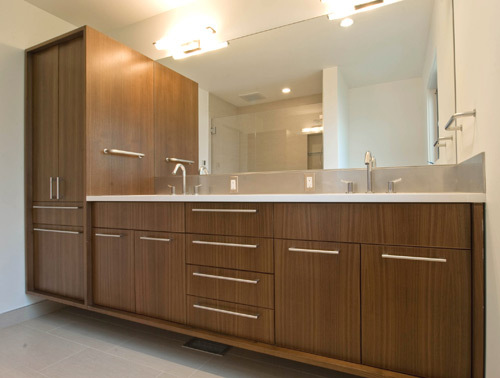 The bathrooms incorporate walnut wall-hung cabinets and Chroma Cascade White 3cm countertops with an eased edge. Large custom mirrors and frameless shower enclosures with Satin Chrome MT series hardware from Distinctive Glass keep the walls deliberate and tidy. Tile selections from Pental combined with Schluter aluminum edge strips maintain a serious, but warm look in the bathrooms. Panasonic Whisper Quiet ceiling mounted bath fans do their job discretely without creating a visual eyesore. Lights are always a challenge with bathrooms – we like to provide light without the light fixture being the center of attention. Lightolier 5” recessed can lights with Alzak trim provide general lighting while wall mount Luna vanity lights by Tech Lighting provide more direction lighting at the mirrors. The floor at the master bath is heated with electric heat mats. 12 x 24 “Feel Colonial” wall tiles over greenboard line the shower walls. We used a Hansgrohe Raindance jet hand shower and Unica wall bar at the master. 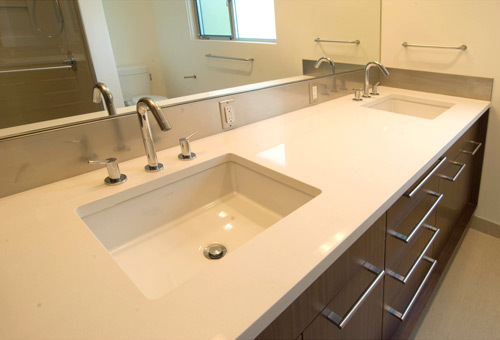 The sinks are the Kohler Verticyl rectangular lavatory with Hansgrohe Talis faucets. The toilet is the Toto Nexus with soft close seat. The kid’s bathroom uses 12 x 24 “Park Ash Gray Matte” tile and “Glossy Chiaro Glass Darjeling” accent tile at the shower. Plumbing fixtures at the kid’s bath match the master bath. A sauna and guest bath are located in the basement. You can read more about the sauna here. 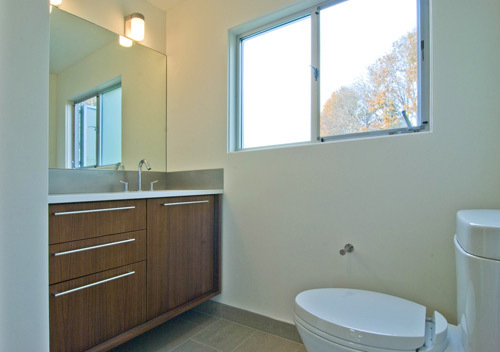 The bathroom includes a Lacava Aquagrande sink with a Kohler Stillness deck-mount faucet. The basement includes a guest room and a large playroom. Quietly working away in the basement utility room is a Rheem 75,000 btu gas furnace. Overall the interiors achieve that warm Scandinavian modernism that we’re always striving for, at the same time this MCM house has another 50 years of life in it. okay, we’ve talked enough –your turn, hit that comments button. I want you to redesign my future house when I win the future lottery. @ John – Thanks for checking out the work. Much of what we do is calibrated so that you DON’T have to win the lottery. Good to know! Love you the work. When the time comes, I’m calling you guys. beautiful! I’ve been doing a lot of fieldwork for historic districts in mid-century neighborhoods, and there will be a lot of houses that need this sort of refreshing in the coming years. glad to see an excellent precedent set on the interior. I’d love to know what the exterior looked like before you began, particularly since you resided it. did you use a similar material? Love how all the different varieties of wood work together, very impressive indeed! One question on the kitchen lay-out: I thought the “traditional” idea of kitchen design was to create a work triangle between refrigerator, washing (sink) and cooking (stove). You clearly deviated from this, what is your take on the functionality of the kitchen in its current form? Don’t get me wrong, the kitchen blows my mind, just looking for the background in that decision-making process. Hi Michel – I am the homeowner so I was interested in your question. We struggled with where to put the refrigerator as the classic triangle layout really didn’t work in this kitchen. After living here for a week or so, I have to say that I am very happy with the functionality and I really like the placement of the fridge, stove and sink. I think the key is having enough space to work and a place to put things when you take them out of the fridge -the island is key. First off, congratulations on a beautiful home! Second, thanks for the reply, I really appreciate the additional insight. I believe that the traditional triangle idea may not necessarily work in all homes and I think the solution you have created in your home is indeed innovative and effective. Again, thanks for chiming in and enjoy your fabulous home! @ Sara -the original siding was a vertical painted 1×4 cedar. For the new siding we moved to a horizontal 1×4 stained T&G cedar to better compliment the long horizontal lines of the home. The stain also lets some of the natural texture of the cedar come through. Modern architecture is often criticized as being austere and cold, but this project is a great example of how warm and inviting modern design can be. The use of different woods turned out nicely. @ Madison -we take queues from the Scandinavians who have really mastered the concept of “warm modernism”. Thanks for the kudos. Another beautiful design and execution — congratulations. Curious to get more detail on the stainless kitchen and backsplash. Specifically, what material did you use? Also, how did you treat the kick-plate in the kitchen as the pictures do not show this detail. Nice Project guys! On this project did your cabinet shop lay up their own panels using flitches from Edensaw or did you use an off the shelf veneer panel? Had any sucess with reconstituted veneers? I have used some of the reconstituted veneers before and like the idea but in a large panel it looks like it is, fake wood. Off the shelf panels or even panels that are ordered in are always from different trees and never match well. With a project like this we will reserve an entire log at Edensaw, send some of it to the mill and have a 30-40 sheet unit pressed as secondary pieces. The rest of the veneer will come to the shop and I will lay it up on our press on either 1/2″, 3/4″ or even 1″ core material for primary faces and panels. By doing this I can make sure that componets of a piece match in color and overall pattern. Nice designs guys. I think I still need to win a lottery for this kind of design even if it’s calibrated to be cost-efficient. That kind of house are for the big boys. Not for young boys like me. But in the future, I will try and have this kind of house, with you guys, as my designer. Thanks for the inspiration! 1. You painted the brick again! 2. The steel table is the one… send me a note. You guys do some great work! Its nice to see what’s happening locally and who’s doing it. Can you guys give me a pointer on achieving a “trimless” door jamb? I’m replacing new doors in my home currently and would like to bring the drywall right to the side of the door jamb to complete the look we want to achieve. We’ll be flush to the jamb–rather than in front of it. @Steve -we’ve got a clean, simple door jamb detail that we like to use and we’re more than happy to share it. We’ll get a blog post up soon that covers it. Can you tell me some specifics on how the hardwood floors were finished? First, is that white or red oak? Second, the “Swedish Finish” is pretty straightforward. I looked into that product called, “Glitsa.” But the “yellow” stain, can you tell me what you used specifically? The stain is applied before any Swedish finish, correct? Swedish finish just hardens the surface and brings our character, it does not change the color. Is this correct? I have 30-year old floors I believe are white oak and I’m struggling w/ how to refinish them. I happen to live in an area where most finishers don’t tackle modern interiors. I have only once chance to do it right. Answers as follows, although I would highly advise you consult with someone in your area about all of this. White oak, Swedish finish (by our vendor, not sure if it was Glitsa or other) with a stain before the Swedish. Have your local installer provide a couple of test stains with one layer of finish. Assume it will yellow slightly over time from there, but the tests will provide a very close approximation. We are just starting the updating of our home in MN, and so wish you were in our area. Any recommendations for selecting a good MCM crew for those of us too far from you? @ Julie S -unfortunately we don’t have any resources in MN. We recommend a search on local blogs or Angie’s list. Beautiful work. Functional question: the ceiling pitch seems to match the roof pitch in several living areas, so where do you run the heating duct work? I want to build a mom in texas and will most definitely need ac. Again, beautiful with great attention to detail. @ Bob – the heating ducts are in the floor joists between the main floor and basement/crawl space. Most homes in the Pacific Northwest don’t have A/C so installing ductwork in the ceiling joists isn’t usually a requirement.